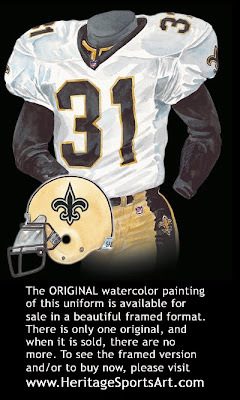 Please click on the evolution of the Saints uniform poster above for a close-up version of the poster. The descriptions below give you some insight and background about the uniforms and/or eras depicted in the poster. 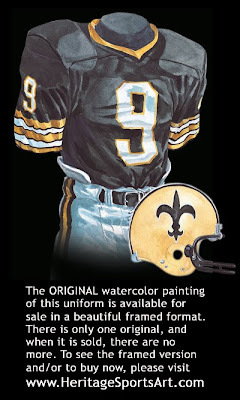 On November 1, 1966, the NFL awarded its 16th franchise to New Orleans. It was All Saints Day, therefore no one was really surprised when, in January 1967, through a fan contest staged by the New Orleans States-Item, the team was named the Saints. 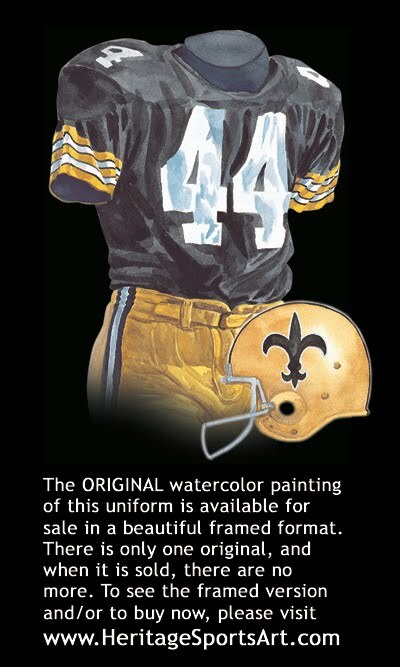 Regardless of the contest, the team would have been named the Saints, keeping with the day they were born. New Orleans is world renowned as the city of Jazz, as well as the famous marching song, ”When the Saints Go Marching In”. Eager to create as much fan enthusiasm as possible in a city that hadn't previously been exposed to pro football, the Saints obtained three future Hall of Famers for their 1967 roster: HB Paul Hornung and FB Jim Taylor (a Louisiana State grid hero) came from Green Bay, and DE Doug Atkins came in a trade with the Chicago Bears. In their first season-ticket drive, the Saints sold 20,000 tickets on the first day, and 33,400 before the first game. The Saints took "The City That Care Forgot" by storm. They won five of their six pre-season games. On September 17, 1967, they opened the regular season against the Los Angeles Rams. Before a packed house of 80,879 in Tulane Stadium, John Gilliam took the opening kickoff and raced 94 yards for a touchdown. Unfortunately, the Rams went on to win, 27-13. A final-game victory over the Washington Redskins allowed the Saints to match the 3-11 first-year record of both Minnesota (1961) and Atlanta (1966). This white away jersey has gold numbers on the front and shoulders, with black and gold stripes on the sleeves. The helmet is gold with a black Fleur-de-lis on it, which represents the large numbers of French Colonist who settled in Louisiana. The period of time between 1966 and 1969 warrants a bit of explanation. The 8 team AFL began in 1960 as a rival league to the NFL - both leagues competed head to head for players, fans and TV revenue. And thus it was for 5 years - two separate leagues, two separate champions (although few people would have honestly believed that the AFL champion could have beaten the NFL champs). The Saints signed K Tom Dempsey, and it pays off as he kicks a 55-yard field goal. Not only was it the longest field goal to date for the Saints, it was the longest field goal of the season, and just one yard shy of tying the NFL mark. 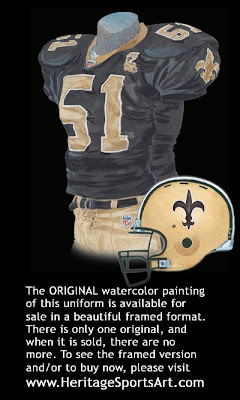 This black home jersey has gold numbers on the front and shoulders outlined in white. Note the patch on the right shoulder of the jersey, which celebrates the NFL’s 50th anniversary. Also note the change of the mask on the helmet. New Orleans faltered year-after-year-after-year-after-year on the field. Still, they managed to thrill their fans with some exciting victories and memorable moments. No doubt the most famous was Tom Dempsey's last-second, NFL-record, 63-yard field goal in 1970 that carried New Orleans over Detroit, 19-17. 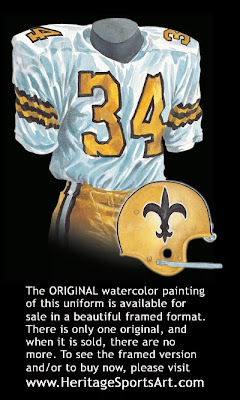 Outstanding players such as QB Archie Manning, RB George Rogers, LB Rickey Jackson, and place-kicker Morten Andersen were integral to the Saints and their march toward respectability. Unfortunately, this didn’t change their luck as the Saints finish the season with a 4-8-2 record. This black jersey shown has the numbers on the front and shoulders, with the sleeves being a little shorter than the rest of the jerseys. The mask on the helmet has changed, but the fleur-de-lis stays the same, representing the French colonists who settled in Louisiana. Richard F. Gordon retires from the U.S. Navy aerospace program and is appointed executive VP of the Saints. New Orleans makes it to their first appearance on ABC’s Monday Night Football, only to lose the game in front of their own fans to the Kansas City Chiefs, 20-17. The Saints finished the season with a 2-11-1. We have added a picture of a neck guard with this white away jersey as it was in this season that most teams started using them. Note the numbers on the jersey are no longer outlined. As well, note the mask on the helmet. The Saints set a club record for points in one half of a game with 42 points in the 2nd half (on 6 straight possessions) in a 42-14 win over the home team Tampa Bay Buccaneers. As the Saints move into an undisputed 1st place lead in the NFC West with a 14-10 win at the Washington Redskins, the Saints stop Washington a total of 18 times with goal to go and 7 times within the 2 yard line in a defensive masterpiece. RB Chuck Muncie rushes for 128 yards vs. the Oakland Raiders in a Monday Night Football matchup at the Superdome to become the first Saint to surpass the 1,000-yard milestone while on his way to a 1,198-yard season. Unfortunately, the Saints watch their 35-14 lead disappear in a 42-35 loss to the Raiders. The Saints end their season with a club-record 8-8 after beating the eventual NFC champion Rams, 29-14. This black jersey has white numbers outlined on the front, and if you look closely, you’ll notice that the numbers have been moved from the shoulder to the arms. Also, the colour gold has been added to the neckline. 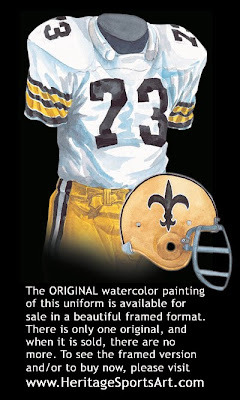 The helmet mask is changed once again, however it does keep the fleur-de-lis, which represents the French colonists who settled in Louisiana. The Saints record their 1st-ever win on prime time with a 27-24 Monday Night Football victory over the Pittsburgh Steelers in the Superdome. Owner John W. Mecom Jr. announces that the team was for sale for the non-negotiable price of $75 million. The Saints finish the season with a 7-9 record. The winning era in New Orleans was ushered in on June 3, 1985, when New Orleans businessman Tom Benson acquired the franchise from Mecom. Benson immediately hired Jim Finks, a future Hall of Fame administrator, as president and general manager, and Mora as the head coach. The pair soon turned the Saints into one of the NFL's most potent franchises. Mike Ditka, the Hall of Fame tight end and former Chicago Bears coach, guided the team from 1997-1999. In 2000, former NFL linebacker and long-time assistant Jim Haslett was hired as the new head coach. This white away jersey differs from some of the past jerseys as the black numbers on the chest and arms are outlined in gold. The black pants have gold and white stripes , and the stripes around the arms are black and gold. Note the mask on the helmet has changed. What a year of firsts! On the franchise's 22nd birthday, the Saints post the largest margin of victory in team history, shutting out Atlanta 38-0. The win was the 1st in a team-record 9 consecutive triumphs to close out the season. The team holds on with two magnificent goal-line stands in the 4th quarter to beat the Pittsburgh Steelers, 20 - 16. The victory ensures the Saints’ 1st-ever winning record. With the win against the Tampa Bay Buccaneers by a score of 44-34, they lock up their 1st-ever playoff appearance. Winning their seventh straight game against the Houston Oilers 24-10, they claim home field for the NFC Wild Card Game. Down 24-3 in the 2nd quarter, the Saints rally behind backup QB Dave Wilson for a 31-24 win, the biggest come-from-behind effort in Saints’ history. FB Hokie Gajan, who attempted to come back from a 1985 knee injury, injures his other knee, and is forced to retire. In September, the NFL Players Association announces that players will be on strike following the weekend’s games. In the club’s first replacement game, the Saints defeat the L.A. Rams 37-10 in the Superdome before 29,745 fans. Saints QB John Fourcade, a New Orleans native, led team to the win with 2 TD passes. October 15th, and the NFL Players Association announce that the strike is over, but not in time to play in the coming weekend's games. In the final replacement game played by the Saints, they beat Chicago 19-17 on 4 Florian Kempf field goals. The replacements post a 2-1 record. After the Saints fall to San Francisco, 24-22 in a Superdome thriller, head coach Jim Mora made his highly-publicized "coulda, woulda, shoulda" proclamation to the media. The Saints beat Green Bay, 33-24 to finish the season with 12-3 record. Later that night, the San Francisco 49ers won their final game which kept the Saints from winning their 1st-ever division title, and gaining home-field advantage in the NFC playoffs. The Saints were set to host the Minnesota Vikings in the NFC Wild Card game. 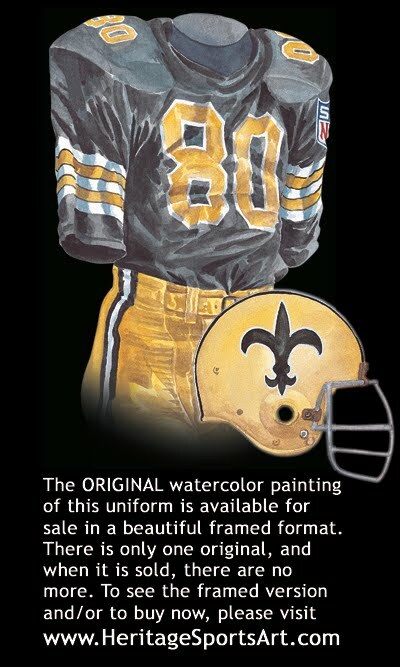 In 1979 and 1983, the Saints finished 8-8, and it wasn't until 1987, their 21st season, that the Saints had a winning year. That year, under coach Jim Mora, the Saints were 12-3 and finished second in the NFC West. Between 1987 and 1992, the Saints reached the playoffs four times in six seasons, including 1991, when they won their lone NFC West title. The Saints unveil a new logo which debuts on the arms of their jerseys. If you look closely, the logo is the outline of the state of Louisiana with a Fleur-de-lis and a star on it. The numbers have been moved to the shoulders. Note the logo is now placed on the side of the pants on the thick black stripe. The mask on the helmet is also changed. The Saints announce their preseason schedule, which includes a trip in American Bowl 1990 with the Oakland Raiders. The game, which was played in Wembley Stadium in London, England saw the Saints beat the Raiders 17 – 10. On New Year’s Eve, a national TV audience watched the Saints’ Morten Andersen kick a 24-yard FG with :02 left to beat the L.A. Rams, 20-17, which evened the Saints’ final record at 8-8 & gave them a berth into the NFC playoffs. 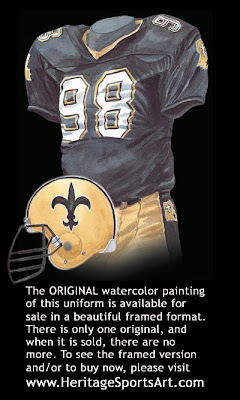 This black jersey carries the new Saints logo – the outline of the state of Louisiana with a Fleur-de-lis and a star on it. If you look closely, you can see the logo on the side of the pants on the thick black stripe down the leg. The neckline has been changed to the colour Gold. Note also the mask on the helmet has changed. In 1979 and 1983, the Saints finished 8-8. But it wasn't until 1987, their 21st season, that the Saints had a winning year. That year, under coach Jim Mora, the Saints were 12-3 and finished second in the NFC West. Between 1987 and 1992, the Saints reached the playoffs four times in six seasons, including 1991, when they won their lone NFC West title. RB Earl Campbell, who played the final 2 seasons of his career with the Saints from 1984-85, was inducted into the Pro Football Hall of Fame in Canton, Ohio. The Saints defeat the Kansas City Chiefs 17-0 for their 1st 2-0 start in team history. They went on to win seven in a row. A 27-0 win over the L.A. Raiders broke a 4-game losing streak, clinched a playoff spot, and kept the Saints in the hunt for the NFC West title. In Phoenix, the Saints beat the Cardinals 27-3 and win their 1st-ever NFC West title with an 11-5 record. The Saints defence allows the fewest points in the league and are 2nd in yards allowed. In the NFC Wild Card Game, the Chicago Bears on their home turf, beat the Saints 16-6. If you look closely at almost all NFL uniforms worn from 1991 on, you’ll note a small NFL shield patch on the jersey’s neckline. 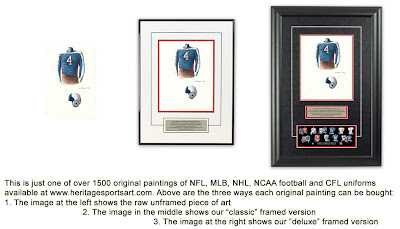 Most NFL uniforms added the NFL logo patch to the neck, and to the upper left thigh of the pants, beginning in 1991. The only major exception to this practice was in 1994 when the teams wore their throwback uniforms, most teams did not wear the NFL shield patch on their jersey or pants. 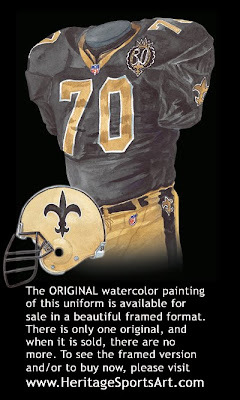 This black jersey with white lettering carries the newest Saints logo – the outline of the state of Louisiana with a Fleur-de-lis and a star – as well as a new patch. The patch on the left shoulder is in honour of the teams 25th anniversary. After battling lung cancer for more than a year, former Saints president/general manager Jim Finks passes away at his Metairie home at the age of 66. The Saints beat the L.A. Rams, 37-34 at the Superdome as Tyrone Hughes returns 2 kickoffs for TD’s on his way to setting 7 team records & tying 4 NFL records. The Saints finish the season with a 7-9 record. 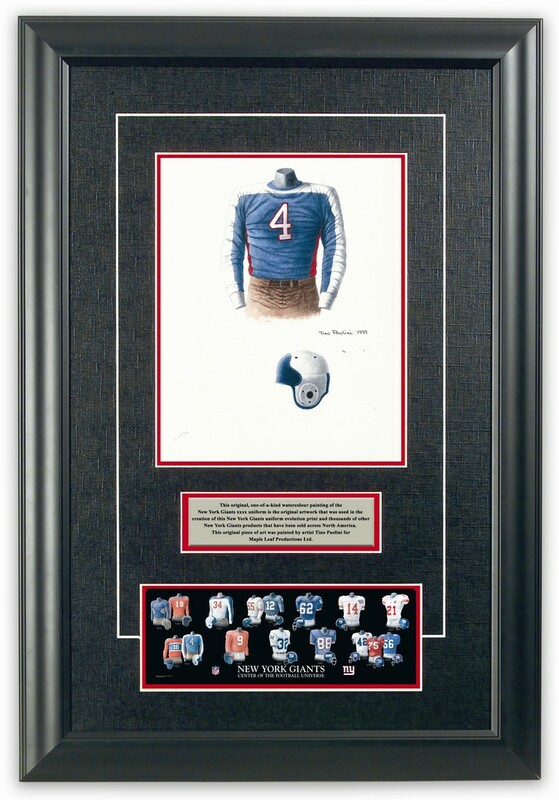 This white 1994 jersey celebrates the NFL’s 75th Anniversary, and is known as a “throwback” jersey. Every NFL team wore a throwback jersey for one or more games during the 1994 season. 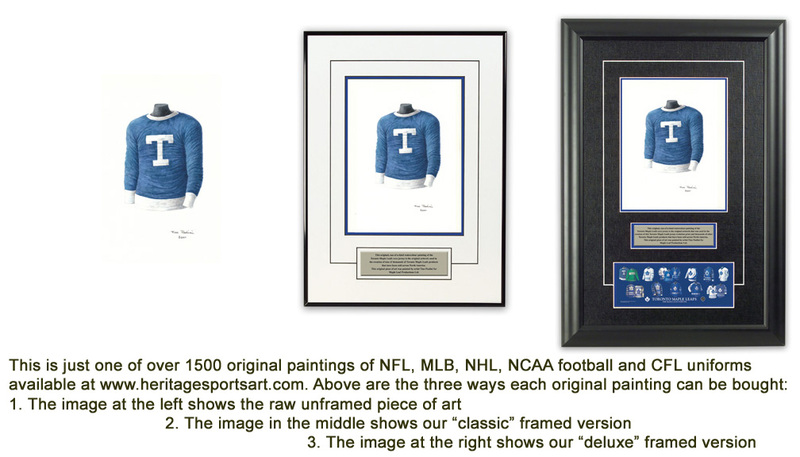 During this season, the NFL and its franchises were showcasing ‘throwback’ jerseys, or replicas of older uniforms to help commemorate the NFL’s 75th anniversary. The 75th anniversary was also commemorated by the diamond patch on the upper left part of the torso - this patch was worn on all 1994 jerseys whether they were "throwback" jerseys or not. While some teams wore the "throwback" uniforms for only a few games, others used them for most of the season - for instance the San Francisco 49ers wore them for almost the entire season, including the Super Bowl. This season starts off well as Bill Kuharich, VP of football operations, was promoted to VP/general manager, Jim Haslett was promoted to defensive coordinator, and T William Roaf & CB Eric Allen making an appearance in the Pro Bowl in Honolulu. However, the good fortune of the Saints ends as they finish with a 3-13 record. For the 1st time in club history, the entire Saints organization is housed under one roof when they move to the club’s new facility at 5800 Airline Drive in Metairie. After a 19-7 defeat to the Carolina Panthers a day earlier, Saints head coach Jim Mora, the longest-tenured coach in all of professional sports, resigned after 10 1/2 years with the club. Mora, who led the Saints to their first winning seasons and first-ever playoff appearances, ends his stay with a short statement thanking owner Tom Benson and the Saints fans for their support. 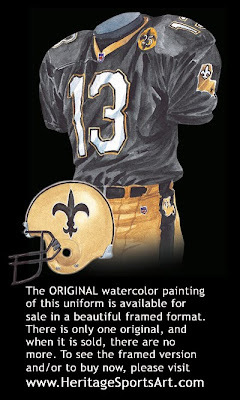 This black jersey removes the black and gold stripes from the arms, and adds the newest logo – a gold Fleur-de-lis. If you look closely, there is a patch on the left shoulder of the jersey, which is in honour of the teams 30th anniversary. Also note the mask on the helmet has changed. Finishing the 1999 season with a 3 - 13 overall record, Saints owner Tom Benson fires 22 employees, including president/general manager Bill Kuharich as well as head coach Mike Ditka. Following through on his promise to "take whatever steps are necessary ...", Saints owner Tom Benson hired Randy Mueller as General Manager of Football Operations, and Arnold D. Fielkow as Director of Administration. Mueller joined the Saints from the Seattle Seahawks, where he spent the previous 17 years in player personnel, including the last 5 as vice president of football operations. Fielkow joined the Saints from the Southern League of Professional Baseball, where he was president as well as general counsel for 6 years. Randy Mueller hired former Saints assistant coach & defensive coordinator Jim Haslett as the 13th head coach in the club’s history, forming one of the youngest GM/head coach combinations in all of pro sports. Haslett spent the previous 3 seasons as the defensive coordinator of the Pittsburgh Steelers. Signing their 8th free agent acquisition of 2000, former San Diego Chargers DT Norman Hand, to a 5-year deal, marked their busiest off-season in club history and places them at the top of the league in free agent activity. After a 1-3 start, the Saints began a 6-game winning streak, their fourth longest in club history, by beating the Chicago Bears on their turf 31-10. In a 31-15 victory over the San Francisco 49ers in the Superdome, brothers Willie (Saints) & Terry Jackson (49ers) became the first pair of siblings to score in the same game since 1924. 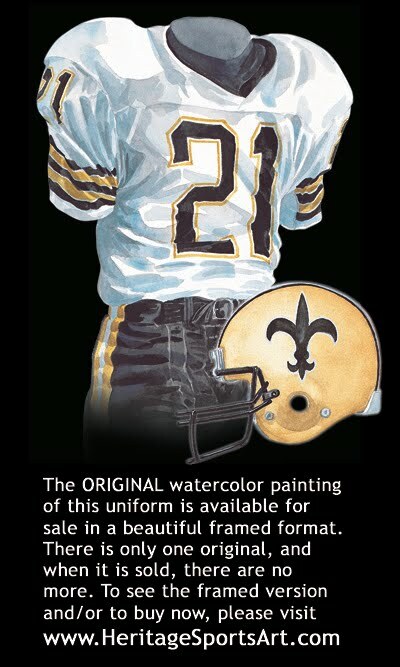 This white jersey with black lettering carries the new logo on the shoulders and the leg of the pants – a Fleur-de-lis. If you look closely at the neckline and the top left thigh of the pants, you will notice a small NFL patch. 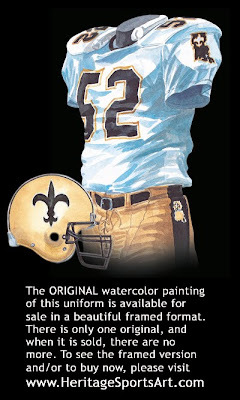 Most uniforms added the NFL logo beginning in 1991. The only exception is in 1994, when the teams occasionally wore “throwback” uniforms celebrating the NFL’s 75th anniversary. Note also the mask of the helmet has changed, as well as the addition of a visor. 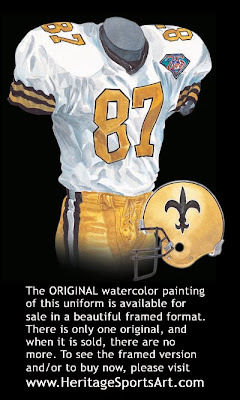 The helmet itself stays the same with gold colouring, as well as the black Fleur-de-lis, which represents the French colonists who settled in Louisiana.